The hypocrisy of this ideal is easily enough disproved. Florida State. Penn State. Florida. Baylor. The other Baylor scandal you’ve already forgotten about. Minnesota. Michigan State. Ohio State. Stanford. Harvard. Amherst. Steubenville. Bixby. USA Gymnastics. USA Taekwondo. USA Diving. USA Swimming. Maryland. Central Florida. This list could go on, but let’s cut to the chase and get to the closer: Kavanaugh’s beloved alma mater, Yale. College athletics only grew more popular in the following years, which posed a problem when injured football players tried asking for worker’s compensation. After all, weren’t they employees of their universities, same as the person working in the book store or the cafeteria? Rather than start paying, because in an injury-laden sport like football that could get very expensive, the NCAA codified the scam term “student-athlete”—saying they didn’t have to pay injured football players because they weren’t employees. The American public bought into concept, which only pushed the narrative of sports building men even further. These athletes didn’t need to be paid with money; they were paid with an education and character. And who peddled this myth? The local sports pages, which happened to be written exclusively by men. For decades a good local sportswriter could turn any athlete, almost always a man, into a hero—regardless of how that man actually treated the people in his life. They did this again and again and again and again and some still do. Looking the other way grew easier as sports departments, awash in all that cash they weren’t paying athletes, hired public relations specialists and recruiters and coaches whose job duties included taking calls from the police. Countless successful coaches have peddled their dogma in biographies even though, at face value, what evidence is there that sports coaches are any smarter than the rest of us? There are upsides to playing sports. There are upsides to lots of activities. But it’s telling that Kavanaugh reached for his high school sports and mentioned them, over and over again, to convey the stature of his character. I don’t believe athletes today are any worse behaved than in the recent past; those stories just aren’t getting buried anymore. But Kavanaugh wanted to perpetuate that mythos, that aura of a certain type of man who you might find a fluffy feature about on the sports page. But we know that’s not true. A piece of the bucolic ideal of sports dies every time another ex-football player is diagnosed with CTE. Or another baseball player is arrested for domestic violence. Or another team owner loses his team for racist comments. Stripped down to all it is, sports is just another reflection of America back at itself. 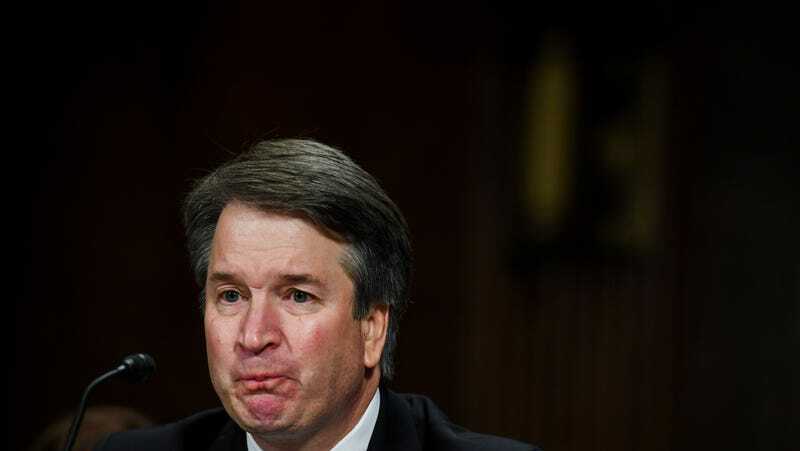 And as shown in the Kavanaugh hearing, that is at times an ugly picture.